Kick off your visit on the 20th (Sat): pause for some serene contemplation at Pielpajarvi Wilderness Church, see the interesting displays at Siida, and then surround yourself with nature on Reindeer Farm Petri Mattus. To see more things to do, ratings, traveler tips, and more tourist information, use the Inari journey planner . Stockholm, Sweden to Inari is an approximately 13-hour flight. You can also drive. Traveling from Stockholm to Inari, you'll lose 1 hour due to the time zone difference. In October, Inari is little chillier than Stockholm - with highs of 3°C and lows of -2°C. Finish up your sightseeing early on the 20th (Sat) so you can travel to Muonio. Muonio is a municipality of Finland.The town is located in far northern Finland above the Arctic Circle on the country's western border, within the area of the former Lappi province. Start off your visit on the 21st (Sun): explore and take pictures at Ice Karting Levi and then head outdoors with Seven Fells Up. 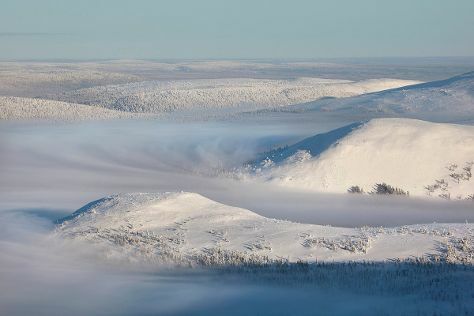 Get ready for a full day of sightseeing on the 22nd (Mon): look for gifts at Elan Ski Shop & Rental and then ski along the peaceful trails at Pallas-Yllastunturi National Park. For ratings, photos, other places to visit, and tourist information, go to the Muonio trip site . Getting from Inari to Muonio by car takes about 3 hours. In October, plan for daily highs up to 1°C, and evening lows to -3°C. Finish your sightseeing early on the 22nd (Mon) so you can travel to Rovaniemi. On the 23rd (Tue), pause for some serene contemplation at Rovaniemi Church, then see exotic creatures in open habitats at a safari tour, and then find something for the whole family at Santa Claus Village. On the 24th (Wed), you'll have a packed day of sightseeing: see Santa Claus Office, then get in on the family fun at SantaPark, then get engrossed in the history at Arktikum, and finally look for gifts at Your Piece Of Finland. To find traveler tips, reviews, other places to visit, and other tourist information, read our Rovaniemi travel planner. You can drive from Muonio to Rovaniemi in 3 hours. In October, plan for daily highs up to 3°C, and evening lows to -1°C. Wrap up your sightseeing on the 24th (Wed) to allow time to travel back home.